South Korea launched its first rocket Tuesday, just months after rival North Korea’s launch drew international anger, but space officials said the satellite it carried failed to enter its intended orbit. A Science Ministry statement called the launch a "partial success," as the satellite separated from the rocket normally before entering a different orbit. The launch could boost South Korea’s space ambitions, but the North warned it would keep a close eye on the international response. There was no immediate comment from North Korea. 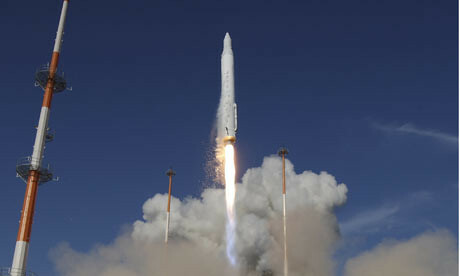 The two-stage Naro rocket — delayed several times since July due to technical glitches — lifted off Tuesday from South Korea’s space center on Oenaro Island, about 290 miles (465 kilometers) south of Seoul, about 5 p.m. (0800 GMT, 4 a.m. EDT). It was South Korea’s first launch of a rocket from its own territory. Since 1992, it has launched 11 satellites, all on foreign-made rockets sent from overseas sites. The rocket, built with Russian help, was carrying a domestically built satellite aimed at observing the atmosphere and oceans. This entry was posted on Tuesday, August 25th, 2009 at 6:18 am	and is filed under Around the Blogs. You can follow any responses to this entry through the RSS 2.0 feed. You can leave a response, or trackback from your own site.